This article originally said that, due to the rotation of the Earth gradually slowing down over time, this winter solstice would feature the longest night ever. Data indicates that the rotation speed has actually sped up slightly over the past forty years (likely due to melting of ice at the poles and the resulting redistribution of the Earth’s mass), and before that, the trend was up-and-down for most of the 20th century — so, as far as we know, the longest night in Earth’s history likely occurred in 1912. I apologize for the error. Thanks to Steve Allen and Ryan Hardy for pointing it out. Today, you might already know, is the winter solstice. That means for people living in the Northern Hemisphere, it’s the longest night of the year. However, as science blogger Colin Schultz points out, tonight will also be the longest night ever. At any location in the Northern Hemisphere, in other words, tonight’s period of darkness will be slightly longer than any other, ever — at least, since the planet started spinning right around the time it was first formed some 4.5 billion years ago. The reason is that the rotation of the Earth is slowing over time. Every year, scientists estimate, the length of a day increases by about 15 to 25 millionths of a second. It may be a truly tiny amount (and it means that even in your entire lifetime, the length of a day will only expand by about two milliseconds), but it forces official timekeepers to add a leap second every few years. The main reason Earth’s rotation slowing down is the moon. Shortly after the formation of Earth, it was impacted by a planet-sized object. This enormous collision threw off the material that would eventually coalesce into the moon, and also sent Earth spinning quite rapidly. In the four-plus billion years since, that spinning has slowed down pretty significantly (with an Earth day going from about six hours to 24 hours as a result) because of the moon’s gravity. The moon’s gravity pulls ocean water slightly toward and away from it, causing tides. But because of the alignment of the two bodies, the resulting bulge of water is slightly ahead of the spot on Earth that’s directly under the moon. As a result, the Earth encounters just a bit of friction from this bulge of water as it rotates, slowing it down slightly. There are a few other things that contribute to Earth’s slowing down, but their contributions are minor. One is that the moon’s gravity similarly causes Earth’s crust to flex, like its water, leading to some friction as well. This one is much simpler. The Earth orbits around the sun on a tilted axis, so sometimes, the Northern Hemisphere gets more exposure to sunlight over the course of a day, and sometimes, the Southern Hemisphere does. This is what accounts for the changing of the seasons. Every year, on December 21 or 22, this tilt means that locations in the Northern Hemisphere get the shortest duration of sunlight they’ll get all year, so they experience the shortest day and longest night. On June 21 or 22, they get the longest days and shortest nights. Meanwhile, everything is reversed for locations in the Southern Hemisphere — they have their longest days in December, and longest nights in June. This artist’s conception portrays the first planet discovered by the Kepler spacecraft during its K2 mission. A transit of the planet was teased out of K2’s noisier data using ingenious computer algorithms developed by a researcher at the Harvard-Smithsonian Center for Astrophysics (CfA). The newfound planet, HIP 116454b, has a diameter of 20,000 miles (two and a half times the size of Earth) and weighs 12 times as much. It orbits its star once every 9.1 days. Artwork courtesy CfA. Kepler’s primary mission came to an end when the second of four reaction wheels used to stabilize the spacecraft failed. Without at least three functioning reaction wheels, Kepler couldn’t be pointed accurately. Rather than giving up on the plucky spacecraft, a team of scientists and engineers developed an ingenious strategy to use pressure from sunlight as a virtual reaction wheel to help control the spacecraft. The resulting second mission promises to not only continue Kepler’s search for other worlds, but also introduce new opportunities to observe star clusters, active galaxies, and supernovae. “Like a phoenix rising from the ashes, Kepler has been reborn and is continuing to make discoveries. Even better, the planet it found is ripe for follow-up studies,” says lead author Andrew Vanderburg of the Harvard-Smithsonian Center for Astrophysics (CfA). Due to Kepler’s reduced pointing capabilities, extracting useful data requires sophisticated computer analysis. Vanderburg and his colleagues developed specialized software to correct for spacecraft movements, achieving about half the photometric precision of the original Kepler mission. Kepler’s new life began with a nine-day test in February 2014. When Vanderburg and his colleagues analyzed that data, they found that Kepler had detected a single planetary transit. The new found planet, HIP 116454b, has a diameter of 20,000 miles, two and a half times the size of Earth, and weighs almost 12 times as much as Earth. This makes HIP 116454b a super-Earth, a class of planets that doesn’t exist in our solar system. The average density suggests that this planet is either a water world (composed of about three-fourths water and one-fourth rock) or a mini-Neptune with an extended, gaseous atmosphere. This close-in planet circles its star once every 9.1 days at a distance of 8.4 million miles. Its host star is a type K orange dwarf slightly smaller and cooler than our sun. The system is 180 light-years from Earth in the constellation Pisces. During the process of verifying the discovery, Harvard astronomer and co-author John Johnson, a former postdoctoral fellow at the UH Institute for Astronomy, contacted Baranec and the Robo-AO team to obtain high-resolution imaging of HIP 116454 to determine whether it has very nearby stellar companions that could be contaminating the Kepler data, causing a misestimation of the planet’s size and other characteristics. “Because of the flexible nature of the Robo-AO system, it was possible to add the target to the Robo-AO intelligent queue, and several observations were carried out within days of the request,” says Baranec. While Robo-AO didn’t find any stellar companions, some additional follow-up measurements hinted that there might be a companion that is too close for Robo-AO to see. To be absolutely sure there were no contaminating companions, Bowler was asked to observe HIP 116454 with the Keck II adaptive optics system. He confirmed that HIP 116454 has no close-in stellar companions. Since the host star is relatively bright and nearby, follow-up studies will be easier to conduct than for many Kepler planets orbiting fainter, more distant stars. “HIP 116454b will be a top target for telescopes on the ground and in space,” says Johnson. MEET ANITA. Strictly, ANITA III—for she is the third iteration of the Antarctic Impulsive Transient Antenna. Her job, when she is launched sometime in the next few days, will be to float, suspended from a giant balloon, over Antarctica’s ice, in order to record radio waves which that ice is giving off. These radio waves are generated by neutrinos passing through the ice, making Antarctica the biggest neutrino-detection laboratory in the world. The particular neutrinos that ANITA seeks are of extremely high energy. Where they come from, no one knows—nor, strictly speaking, is it actually known that they exist, for ANITAs I and II, which were smaller devices, failed to find them. But theory says they should be there, generated in whatever giant explosions also create cosmic rays. Cosmic rays are high-velocity protons, sprinkled with a smattering of heavier atomic nuclei, that fly through space until they hit something such as Earth’s atmosphere, when they disintegrate into a shower of other particles. They have been known for a century, but their origin remains mysterious because, being electrically charged, their paths are bent by the galaxy’s magnetic field. That means the directions they come from do not point to whatever created them. Neutrinos, however, are electrically neutral, as their name suggests. Their paths should thus point back towards their origins. Neutrinos do not interact much with other sorts of matter, but when one of ultra-high energy does so, the result is a shower of particles travelling at speeds which exceed that of light in ice. An object travelling faster than light’s speed in the medium through which it is passing will generate electromagnetic waves. These are known, after their discoverer, as Cherenkov radiation. And it is pulses of radio-frequency Cherenkov radiation, the electromagnetic equivalent of a sonic boom, which ANITA is looking for. Once airborne under her balloon—an object made of cling-film-like plastic that, when fully inflated, will be a fifth of the size of a football stadium—ANITA will take advantage of the polar vortex, a wind in constant revolution around the pole. A wavy polar vortex on January 5, 2014. 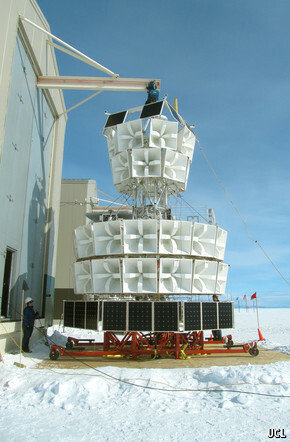 She will fly at an altitude of 35-40km, which will mean her antennae can see 1.5m km2 of ice. Ultra-high-energy neutrinos travelling through the ice are thought to interact with it and produce Cherenkov radiation about once per century per km2, so an area of this size would be expected to yield about 40 bursts a day. ANITA will complete several laps of the continent, each lasting about 15 days. Then the balloon will be cut loose, and she will deploy a parachute and be guided back to the surface for re-use. Astrophysicists are not the only people rubbing their mittens together in expectation of the results of this experiment. The neutrinos ANITA is looking for are far more energetic than anything produced by the Large Hadron Collider, the world’s most powerful particle accelerator. That means they may obey hitherto unperceived extensions of the laws of physics. One possibility is that, among the Cherenkov-radiation-generating particles produced when a neutrino collides with the ice, there may be an occasional miniature black hole. That would be particularly exciting, because such black holes might themselves disintegrate in a characteristic puff of radiation named after another physicist, Stephen Hawking. If Hawking radiation exists, it means black holes are not truly black—a discovery which would almost certainly win Dr Hawking a Nobel prize. Though it is not designed to search for Hawking radiation, ANITA would probably see it if it were there. And, since Hawking radiation is created, quite literally, out of nothing (the particles it is made from emerge from the vacuum of space and then steal the energy needed to become real from the black hole itself), that would assist understanding of a very strange piece of physics indeed.